Archives : ATLAST THE CORRECTION BEGINS - 13 06 2014. ATLAST THE CORRECTION BEGINS – 13/06/2014. Even though many may believe that the sudden flare up in Crude prices due to the Iraqi crisis, was the primary reason for the start of the much awaited Correction, but the fact remains that the market was overdue for a Correction for long time now. Since the start of May, Nifty had gone up by around 15%, whereas the Small-cap and Mid-cap indices had outperformed the Nifty considerably by going up an astounding 41% and 27% respectively. Thus this Correction will be a great leveler as the weak hands which have entered the market wanting quick money will be driven out, and value stocks will attract strong buying interest at lower levels. Market participants dread the word ‘Correction’, but one needs to keep in mind that Corrections are an integral part of a Bull market. In fact in times such as these, they are not only much desired but they are ‘healthy’ for the market. The current rise has been a parabolic rise and a correction was awaited to rectify the excess. Interestingly the Nifty started its correction from the target mentioned for the Flag pattern which was at 7705 and Nifty reversed from a high of 7700, hence the Correction was not entirely unexpected. 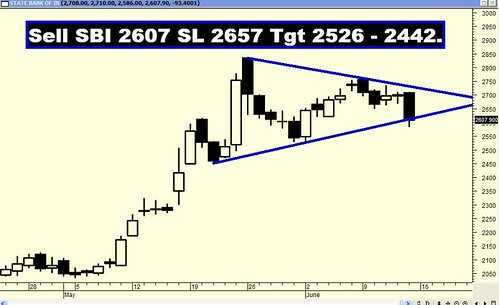 Sensex opened the week at 25543, made a high of 25735, low of 25171 and closed the week at 25228. Thus it closed the week with a loss of 168 points. At the same time the Nifty opened the week at 7621, made a high of 7700, low of 7525 and closed the week at 7542. Thus the Nifty closed the week with a loss of 41 points. Both Sensex and Nifty formed a Hanging Man pattern at the top on Tuesday which is a bearish reversal pattern. The pattern got confirmed on the next day but the impact of this pattern was felt on Friday when both the indices made a big Opening Black body Marubuzo. Interestingly, the weekly charts have seen a small black body formation which is not exactly a bearish pattern. Thus Candlestick analysis point towards bearishness in the immediate term, but the view is not so bearish in a higher timeframe chart. Nifty achieved its daily as well as weekly Bullish Flag pattern target which was at 7705; incidentally the Nifty reached a level of 7700 and just reversed from there. Hence the correction was expected from that level. While moving higher in the current rally, market has left behind two Bullish Rising Gaps which will act as strong supports. The first gap between Sensex 25129-25044 and Nifty 7497-7484 is also coinciding with 38.2% Retracement of the immediate Correction levels mentioned above (i.e. Sensex 25135 and Nifty 7477), thus forming a strong confluence Support zone between Sensex 25135-25044 and Nifty 7497-7477. One can expect some fight from the bulls to protect these levels. If the above mentioned Support zone gets breached, then one can expect the Correction to intensify and the indices to move lower towards the next Support zone which is the second Bullish Rising Gap between Sensex 23729-23572 and Nifty 7067-7020. This is a stronger Support zone as it coincides with 61.8% Retracement level (i.e. Sensex 23598 and Nifty 7044) of the Sensex rise from 22277 and Nifty from 6638. Hence the current uptrend will reverse only if this support zone gets breached. Both Sensex and Nifty are way above the short term average of 20dma (Sensex – 24829 and Nifty – 7413), the medium term average of 50dma (Sensex – 23590 and Nifty – 7048) and the long term average of 200dma (Sensex – 21352 and Nifty – 6356). Thus the trend in the short term, medium term and the long term timeframe continues to remain bullish. MACD and ROC are positive and continue with their Buy signals. RSI is at 65 but it has exhibited negative divergence of the first degree. Stochastic Oscillator continues to remain overbought and has given a Sell signal as %K is below %D. MFI has reduced to 60, suggesting that the money inflow has reduced. OBV is not yet confirming with the price movement. The Directional Indicators continue in Buy mode as +DI is above –DI. Bollinger Band continues with its Buy signal given four weeks ago. ADX has gone up further and is now at a level of 54 which suggests that the strength of the current uptrend is very high but the trend is now maturing. Hence it is suggested to be cautious as some correction in the current uptrend can be expected. Volatility Index India VIX, has bounced to around 17 from a lower level of 13. One can expect a breakout in the VIX index if it closes above 22. It will pave the way towards a level of 28. Highest Put writing is seen at the strike of 7500 and highest Call writing is at the strike of 7800. Thus one can expect a range of the market between 7500 and 7800. Friday saw high amount of Call writing at the strike of 7600 which can be expected to act as an immediate resistance level. For the week ahead, Sensex will find Support at 24913-24587-24163 and will find Resistance at 25543-25859-26124. For the week ahead, Nifty will find Support at 7474-7353-7206 and will find Resistance at 7636-7742-7838. All the recommendations given in previous week did well to reach their targets but the Star performer of the week was Godrej Ind which went up by more than 9%!! !